Oh I didn’t know you could lanolips in boots! Will have to try and find it. 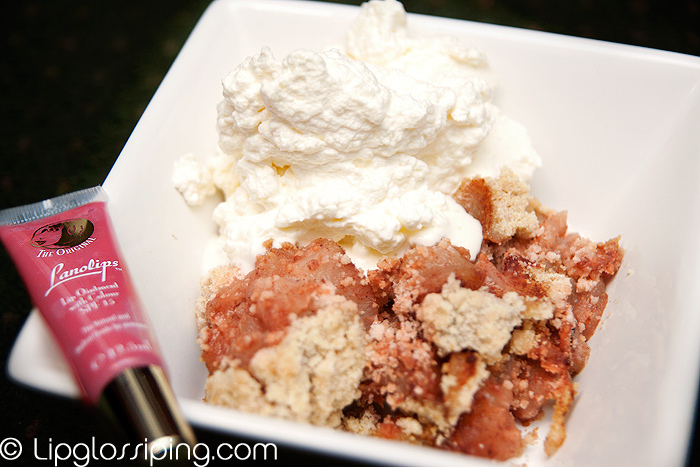 I love anything that you can serve with crumble and cream! Oh God I love rhubarb. That crumble looks amazing. It was yum (apparently) LOL! Living in the Yorkshire Rhubarb triangle am dying at the thought of tinned rhubarb! Made rhubarb crumble last night (spooky I know!) with fresh, forced Yorkshire rhubarb and an all butter crumble As I am yet to start my diet I dived into a bowl the size of my head, complete with custard. Complete heaven if I am being honest, shame about size of arse though. I know!!! I’ll put my wrist out for a slap! In my defence, there was no fresh rhubarb to be found and I couldn’t even find frozen! And as for the crumble? Well… caught bang to rights on that one… sheer laziness. Aren’t you good making crumble for the family and not having any! I salute you! I got Dark Honey and Apples a few months ago and I always carry one of them in my purse. They are wonderful for dry lips! Thanks for the recipe, I’m definitely trying it. I bought rhubarb and custard sweets from M and S today! I’m not into the sheer colors either, or at least not generally. hahah, the only time in my life where makeup takes 2nd place. When food nudges it there! I do love Lanolips Apples!